Last Sunday we attended my cousin's wedding. Wow so many people have arrived already. Let's run, Ah Mah. 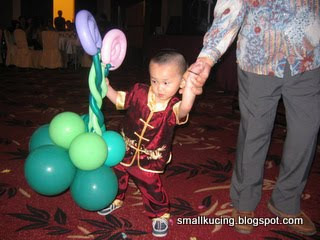 Ah Kong carried me around meeting relatives. Eee... I spotted something over there. As for Kaw Kaw's question whose hand "raba-ing"my ahem ahem, I don't know loh. 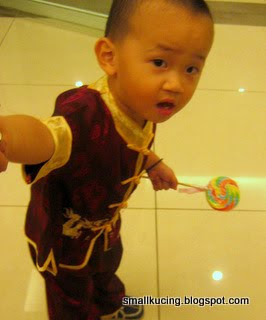 Got Lolipop! For ladies and Kids only. Papa cannot take. 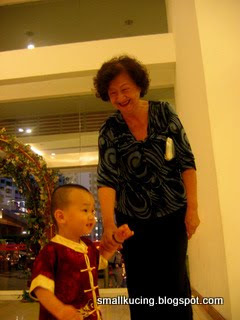 Only Ah Mah, Mamarazzi and me can take. 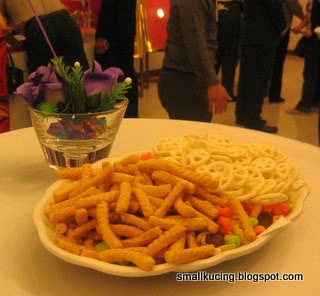 Snacks for those who wanna munch during Cocktail hour. I also want Cocktail. No Ribena Lemon ka? 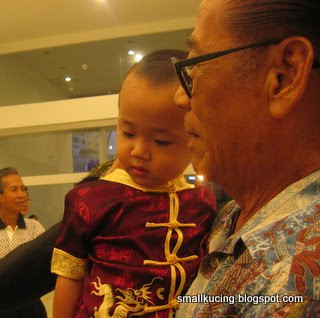 Come on Papa...I wanna go there. 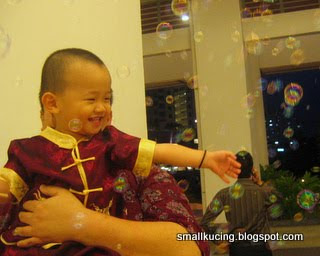 Bubbles everywhere! bubbles bubbles bubbles.. NOooo...Papa...I don't wanna go in yet. 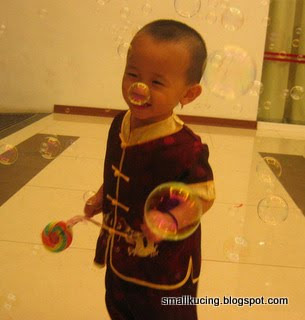 I wanna play with the bubbles some more. Wow! 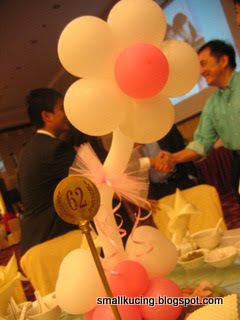 Each table also have balloon ah. Gosh...such a lovely presentation on the table. Got Rose Petals some more. oh no...Mamarazzi having Wine again. 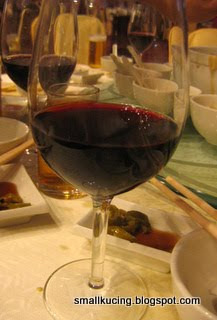 Cham liao...lobster on the table. Very familiar. I baru saw her face last weeks and after that my ahem ahem pain pain. Nice to see you again so soon. You didn't bring your jab jab needle hor? 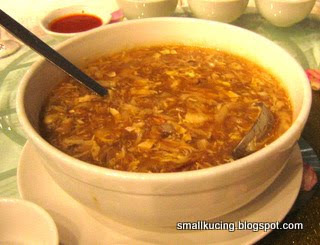 Follow by Braised Sharkfin Soup. Where is the Sharkfin? tarak geh? Must be purposely don't put. It's good. 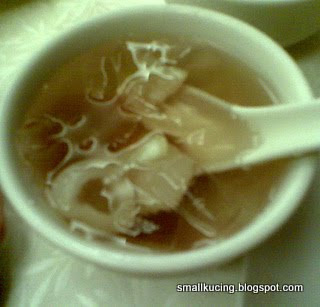 Quit eating Sharkfin and help the endangered wildlife. 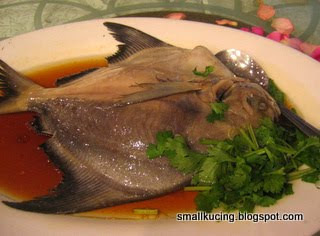 Replace with the more delicious "Hoi Sum". Very tasty and auspicious. 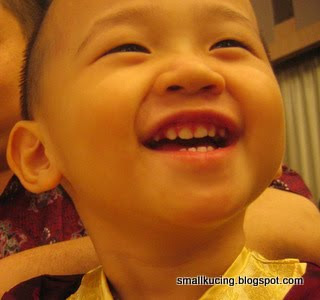 "Hoi Sum" = happy. May the lovely couple happy from this day onwards. Steamed Promfrey Fish. Ngum me coz not much bones. But then even if choke on a fish bone here also never mind .Dr Soh is here. Lovely presentation of the happy couple and the unique wedding cake. I wonder whether it's a real or a mock cake. Maybe later will go and "see". Jeng~Jeng~Jeng~got ready. 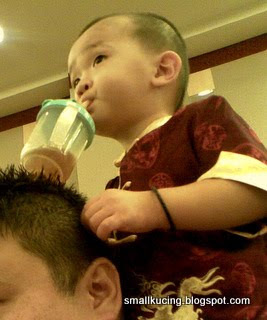 Tenggek at Papa's shoulder. or in my case "Yum Char". Continue makan. 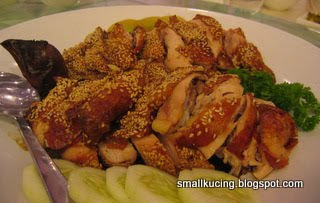 "Pei par" chicken. Ahem ... Auntie Cleff....something look familiar? 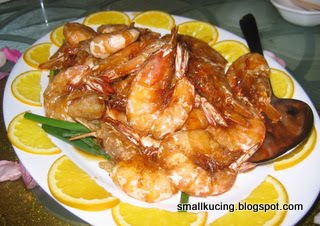 Jeng~jeng~jeng~ prawns...You wanna know how Mamarazzi face looked like after two glasses of Wine? Guess no more. Looks exactly like the Prawns. Kiss Papa. I go play ya? I am full already. Wah...so many balloons. Nobody punya ka? I want balloons. The other day Mamarazzi didn't buy balloons for me. 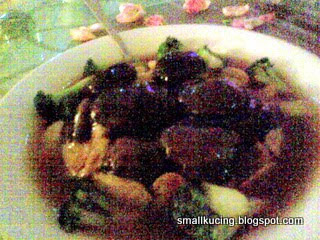 Mixed vegetable and Mushroom. Very sorry for the poor quality of the photo as Mamarazzi's camera ran out of battery. Even the back=up battery also habis. Gotta use handset to snap. 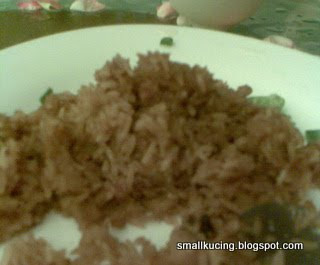 Glutinous Rice. 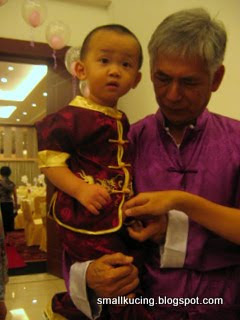 Papa love this rice very much. And refreshing Sea Coconut with Longan Drink. Love it coz got pieces of Lemon in it. 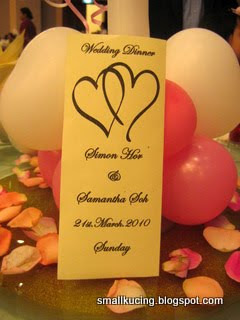 Last but not least, Congratulation Jie Jie Samantha and Kor Kor Simon. Thank you for inviting us to your wedding. It seems to me you have got so many weddings to attend one right? not long ago, kai yeh and kai ma's wedding right? HAHA! 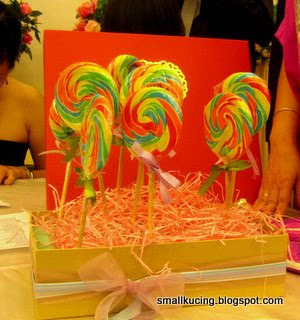 Looks like a balloon lollipop affair! Nice! 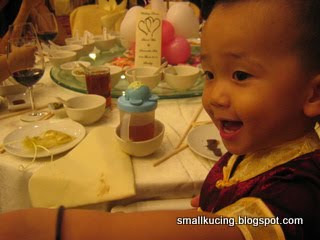 Food looks good... as always at wedding dinners :P.
wow...so many balloons sure happy le. 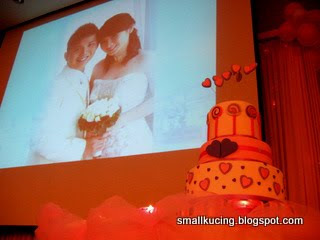 The wedding cake so nice wor...real and boleh makan one? Woo! really lots of balloons wor.. I must say this not to flatter Kathy lar- Kipas Kathy oso no guna rite??..LOL... I think u got talent in writing/ narrating children's stories...Who knows if u'll be the "local JK Rowling" in the future?? 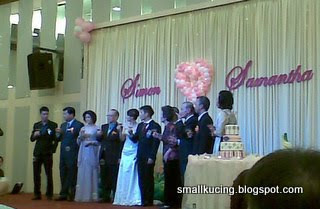 yup...a bubbly wedding affair..influenced by Alice in Wonderland? Yours punya how? any theme? 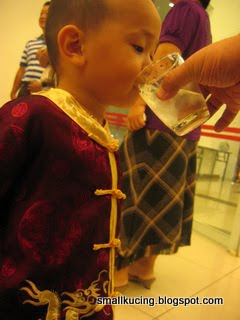 Nice hor...dont know wor...coz was busy chasing Joshua. Didnt get the chance ti check. Yours punya how? 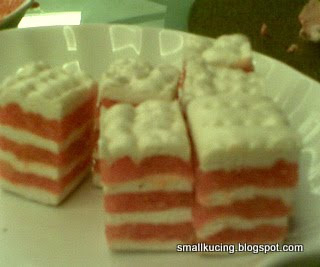 Gng to be a real one or mock cake? 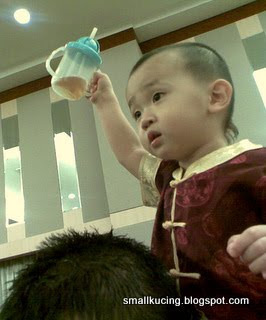 I like the pic where little was holding up his sippy cup during the yam-Seng session! 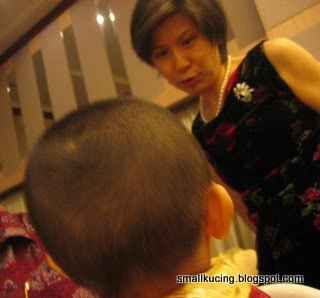 Wah...your face memang looks like your Ah Ma one!!! 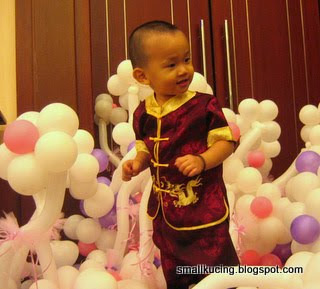 The food so nice wor...and I see you hold one balloon very funny shape one! Hehehehehehe!!! you are so adorable! and whoever took your photo must be a professional. Close ups? No worries, your face is as smooth as a ... errr baby's face! 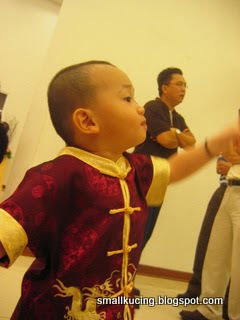 He he he, so cute. I want balloons too! Got fried chicken one or not? Gwen would go crazy over the bubbles and balloons. The food looks so good leh. I'm hungry now. 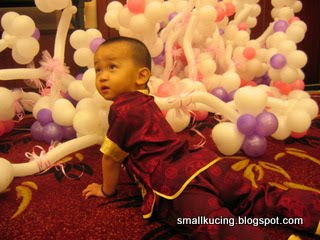 I wish I'm in KL..haih. Towards the end of the evening he did cry. Coz whole day he had been up and about. Tired but still wanna play on stage. Thus cried lo. 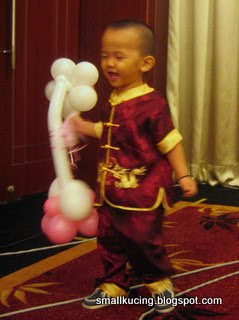 Most of the kids did go crazy with balloons and bubbles..but i think not as bad as this kid. Really like monkey on the loose kakaka. 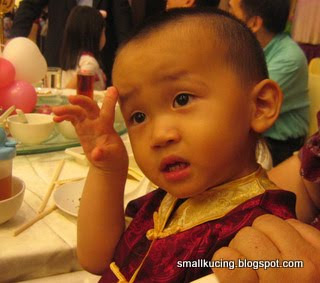 LOL...miss chinese food ya? 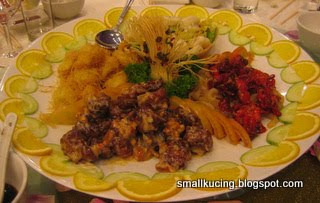 Jakarta also have nice Chinese food. Hubi always go there also. omigosh....lolipops for cocktail? 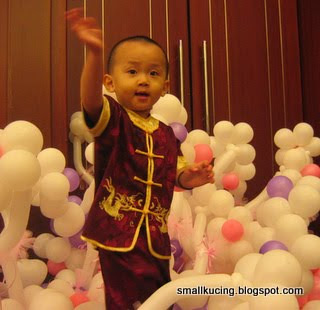 And relly what fun with all the balloons!!! Coz battery on my camera died and the back up battery also died. Had to use my handphone to snap the pic. Lighting at the banquet hall was dim. Yup...really mabuk-ed that night. Arrived home terus pengsan-ed. 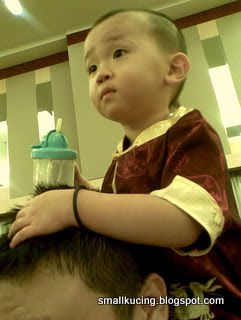 Hubi kau tim the boy while i snoozed. 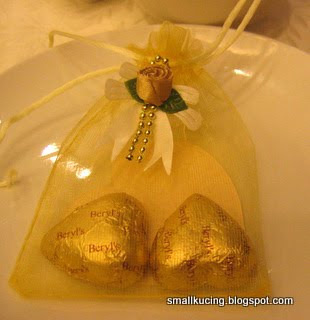 first time i see wedding dinner they give lollipop and double decker snack :-).